put more emphasis on internet and TV sermons. To keep up with the trend, we have redesigned our homepage. 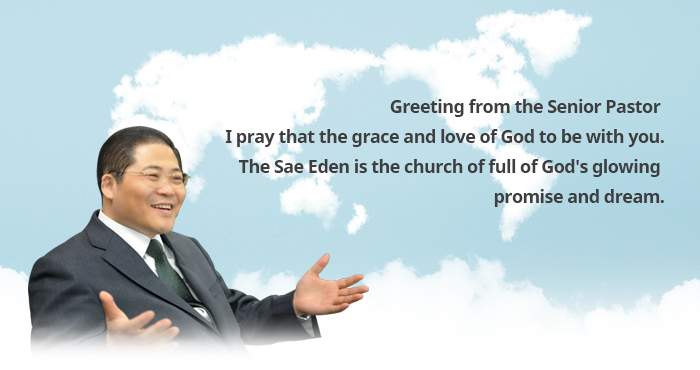 I hope this homepage could be the place where anyone can connect with the latest news of the Sae Eden Church, and be blessed by the words of God. Although people are becoming desolate like grayish city we live in, I do really hope that at least our soul can deliver the scent of Jesus to each other like flowers in the field. Through this website, I wish that we can meet together, we can love more, respect more, and pray more.. The Sae Eden Church has a dream of widely spreading the Christian faith generation after generation to build God’s glorious families and achieve God’s vision. We will do our best to raise the faithful Christian leaders that will lead the unified Korea in the future. Additionally, we will do our best to be the church that loves and serves our community. I pray that God’s amazing love and grace be with the lives of every single person who visits our website.